“Children’s Book” is a book, in which every chapter carries beautiful wishes from artist. It is the art that only happens when everybody participates, or say, reads. “Children’s Book” is more than a book, in which every chapter takes place at different public spaces in the city, such as library, school, store and hospital. It is a public art project that lasts for nearly six months, and is also a daily behavior that happens in our life. The project is expected to warm people. More communication creates more colors and interests for life, and the artist hopes to do more good to the city with other citizens. To add more surprise, thought, and romance to life. 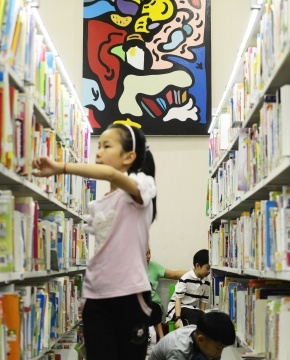 The first chapter of “Children’s Books” takes place at Hangzhou Public Library, and lasts for three months, during which exhibitions, lectures, communications, questionnaires and theme activities will be held. Details can be seen at brochures of each month. “People who have grown up in the culture of the city always see pictures of the sea before they see the sea; they read of love in romance novels and only later do they know love. Our experience is quite often second-hand, borrowed from artificial theatricals, and as a result the line between life and its dramatization becomes difficult to draw.” – from “ Words from the Mouths of Babes” by Eileen Chung. The nature and function of library, coupled with behaviors of people in this space, construct the things happening there. I hope, by using those sections, scenes, and words scattered in the space, to understand the “second-hand experience” described by Eileen Chung, perhaps, vise versa. Children has unconstrained freedom, while audiences have their rights to select their reading, and we need to take some exercises to have our brains relax and walk in unconstrained imagination. A space that always grows and hence a place where people like to stay.